Intensive use puts different demands on a stair runner compared to residential use. De Roode Loper can supply several brands that fit the bill perfectly. Runners that we install nationwide in hotels, restaurants, boutiques, ships and museums, for example. These projects call for strong quality stair runners, often in non-standard sizes and/or colours. Thanks to the ‘custom-made’ options offered by Catry, Skye and Hartley & Tissier heavier qualities can be woven and hand tufted, and bespoke patterns, colours and sizes chosen. Depending on the brand or type, minimum order quantities apply of 5, 10 or 20 linear metres. So the possibilities for smaller projects are equally interesting. 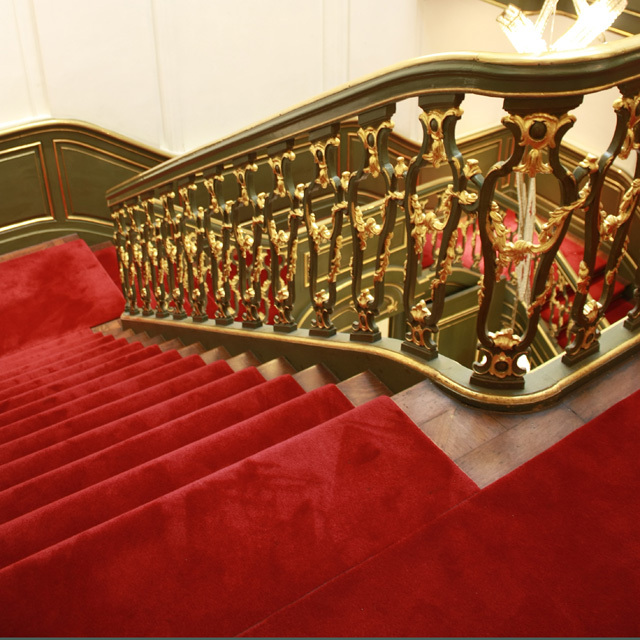 As well as hall and stair runners, the products by Catry, Skye and Hartley & Tissier are also highly suitable for carpeting whole hallways or rooms. Once again, bespoke choices of colours and/or designs are possible.